Alvin Hurd asked if he can restore a Vista backup in XP. I answer both his question and the reverse one: Can one restore an XP backup in Vista? I've never been a fan of Windows' built-in backup programs. They always come with one or another essential flaw that makes them almost useless--like Vista backup's inability to back up or skip particular folders. And they've often used proprietary archive formats that aren't supported by older--or even newer--versions of Windows. So I was pleasantly surprised to discover that Vista's File Backup program stores its backed up files in standard .zip compressed archive files. Windows XP supports .zip files natively, treating them almost as folders. Countless other programs also support the .zip format. You should therefore have no trouble extracting one or more files from a Vista file backup. Except for the trouble you'll have finding the files you want to restore. 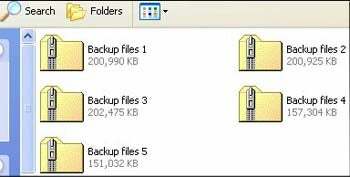 A Vista backup creates multiple .zip archives, and it's not easy to tell which contains the file you're looking for. XP can't read the catalog file with that information. Luckily, XP's file search tool searches for files inside .zip archives. Simply click the Search icon, enter your search criteria, and click Search. Restoring an XP backup in Vista takes special software, as Vista doesn't support XP's backup format. Luckily, Microsoft offers the Windows NT Backup-Restore Utility free of charge. But not free of hassles. Downloading the Restore Utility requires Windows Genuine Advantage (sic), so if you haven't yet given in to that particular irritant, you'll have to do so now. Once downloaded, you can't install the Restore Utility without first turning on the Removable Storage Management feature. To do so, click Start, type programs and features, and press ENTER. In the left pane of the resulting dialog box, click Turn Windows features on or off. Wait for the list of features to appear, then check Removable Storage Management, click OK, and wait. The program isn't easy to use, or even completely safe. The first time I tried the Restore Utility, it rendered my logon folder--and thus Documents, Pictures, AppData, and other important folders--inaccessible. (This is why I keep a separate computer for testing software.) If you follow the instructions below, you should be okay. Use the program's Restore Wizard to recover the files. When you get to the last page of the Wizard, before you click Finish, click the Advanced button, which will extend the wizard for a few new pages. On these pages, have the program restore your files to an Alternate location (make that location somewhere outside the Users folder or your logon folder), and uncheck the options to Restore security Settings and Preserve exiting volume mount points. You'll get your files back.